Automated ultrasonic welding systems are used primarily for joining plastics, especially for electronic connector assemblies. 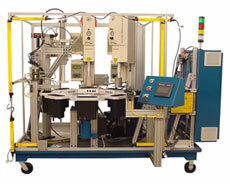 Automated ultrasonic welding systems perform high frequency/high energy applications. In addition to soft and rigid plastics, they are also sometimes used to join foam and for speaker applications, etc. Automated ultrasonic welding systems can be quite complex and require a lot of experience to develop. Experience that we have here at Dial-X Automated Equipment, Inc. We can also work with many different welder manufacturers, giving us the flexibility to meet your exact needs. For further information or a free quote on automated ultrasonic welding systems, contact Dial-X Automated Equipment, Inc.